Welcome to the Ocean Front Cliff House. The home is surrounded by 3 acres of tropical flora with no other home in sight. 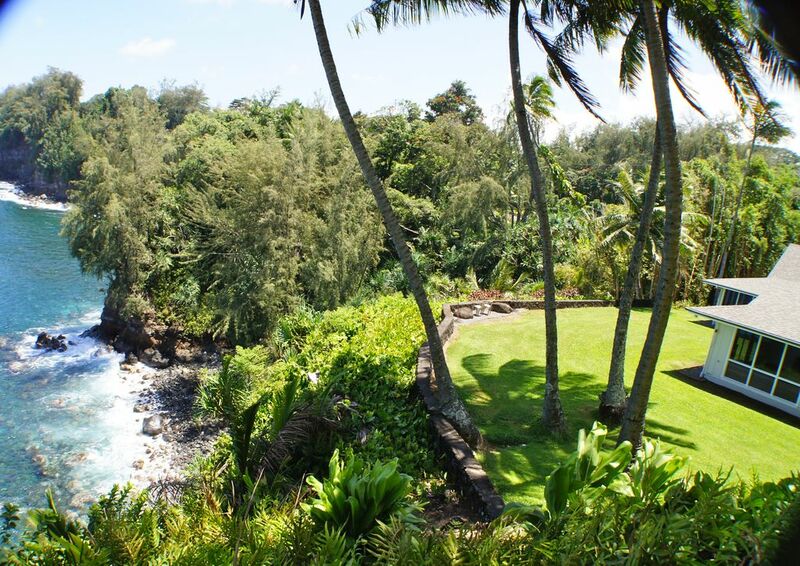 Extremely private, yet easy to find and located 13 miles from historic downtown Hilo and 15 miles from the Hilo Airport. Close to waterfalls, botanical gardens and zip-line adventures plus the beauty of the Hamakua Coast and ocean. The property is conveniently located with a private gated driveway and directly off Hawaii Belt Road (Highway 19). The cottage is separated from our home by a breezeway and lanai. The Ohana is approximately 1000 square feet which includes: 1 bedroom, 1 bathroom, living/dining space and kitchenette, but the best part is the view! We are renovating the main house but not when guests are staying. We also are not on the property when guests have reserved the cottage. Come stay and have the view take your breath away with it's beauty. We are originally from California, but have always had a love for Hawaii. I spent childhood vacations visiting my grandfather in Maui and we've been coming to the Big Island to visit my father since he retired here in 2000. My husband and I are both serving in the US Navy. For us, it was all about the view. We love waking up to beautiful sunrises over the water and seeing waves crash along the rugged coastline. We hope you will come stay and fall in love with it like we have! Our managers, Sandy & Bob are very attentive if you need anything during your stay. Comfortable Bamboo seating with ocean views everywhere. Stove top only, no oven. Limited supply of paper goods. Limited selection of condiments and pantry basics. Dishes, glasses & flatware. Cookware basics. Small kitchenette with pots and pans, utensils, blender, toaster oven, toaster, Mr. Coffee, Tea kettle. Dining table seats 4 and kitchen island has two counter stools all with ocean views. Playing cards, dominoes and learn how to play the ukulele. Cottage is located on 2 acres of lush landscape. No need for AC or central heat in Hawaii, the louver windows open to bring in the breeze. Ceiling fans hang in dining area and bedroom and an oscillating stand fan is at your disposal. No access to on-site laundry facilities. Dry cleaning and laundry facilities are located in Hilo. Mahalo nui loa for the high praise and compliments. Visiting this beautiful island is so special, so we like to make our guests stay part of that wonderful journey. We hope your dreams come true and you get to live in paradise too someday. Perfect, wonderful, fabulous, spectacular!! ~ And the view! I want to buy this house! What a fabulous find and so affordable! Complete privacy while we were there as the owners are remodeling their side of this spectacular duplex on the cliff overlooking the amazing blues of that incredible ocean! We would rent it again in a heartbeat. Fully stocked kitchen allowed us to cook at home almost every night. Wash dishes while overlooking the infinite expanse of sky and sea. CLOSE to Hilo and Laupahoehoe Point, which you simply must not miss! I can't think of enough good things to say about this place. The manager was very friendly to deal with and available. There is a landline at the cottage because your cell won't work, and that is really nice! Free parking and wifi and complete privacy. There is not a neighbor in view! It's just you and your love and the big blue ocean. Simply fabulous vacation in paradise. Thanks! We too love going to Laupahoehoe Point, it's one of our favorite places to watch the big surf roll in. We try to have a lot of the things our guests might need so that you don't have to haul everything with you in your cases. By the way, we would also enjoy having you back as guests in a heartbeat as well. So in that case, I will say "a hui hoa" which means, until we meet again. Absolutely amazing spot. Plenty of space for a couple, and the location is great for getting away, and also close enough to the city to be able to head in whenever you like. Absolutely going to go back again. The views inside and out side of the home are amazing. We were able to see a Hawaiian Hawk on multiple occasions as well as humpback whales in the ocean from the front yard. Inside of the home is well taken care of and comfortable. Would stay here again in a heart beat. Beautiful private setting. The house has great character. Fall asleep to the sounds of the waves crashing on the beach and waking up to spectacular sunrises every morning. Great things to do a see North and South within minutes of driving.. Thank you so much for sharing your stunning home with us. From the moment we entered the gates, all we could say was "Wow!" Gorgeous gardens, breathtaking views, and an immaculate home centrally located to everything we wanted to see on our vacation. Loved the lanai! We spent many a late afternoon there relaxing after a day of exploring while watching the sun go down. I reviewed some of our favorite local attractions on gogobot so you can check those out and you can see what other people are saying about them. Locally, I think the little town of Honomu, and Akaka falls are must sees (located approximately 2 miles from our house). If you want to do something adventurous try ziplining (we recommend Skyline Akaka Falls - also located in Honomu). Downtown Hilo is 13 miles away and has plenty of restaurants, grocery stores, museums, and other outdoor activities. The nearest airport is 15 miles away, also in Hilo. 3-4 night minimum stays may be required during peak events or holidays. Monthly cleaning $115.